January 20, 2017 – Today marks the start of the presidency of Donald Trump, a man who has made it clear that he intends to reset old alliances and agreements covering everything from trade to security. Apart from Russian President Vladimir Putin, for whom Trump has proclaimed a deep affection, political leaders and ordinary citizens around the world anxiously wait to learn what this new administration will mean for their relations with the most powerful country on the planet. For Canada, whose economy and security depends heavily on maintaining strong relations with its American neighbours, the uncertainty of this new era is punctuated by virtual silence from the new president, who has seen fit to disparage traditional allies and friends, including Mexico, Germany and Japan. Divining Trump’s feelings about his neighbour to the north is a guessing game at best, but one thing we needn’t guess about is the standing of Canada among U.S. residents – Trump supporters and detractors alike. A national survey of a cross-section of 1,500 voting-age Americans, conducted by the Angus Reid Institute in the days leading up to the inauguration, reveals a strong attachment to Canada among the U.S. public, while Americans hold a decidedly different attitude toward their country’s other neighbour, Mexico. This U.S. survey asked respondents about how the Trump administration should approach each of 18 countries using one of five response categories: as a valued partner and ally; as a friend; cautiously; as a potential threat; or as an enemy. The country list excluded a few countries where the answer was obvious, but it included a wide array of other countries for whom American policy is important. 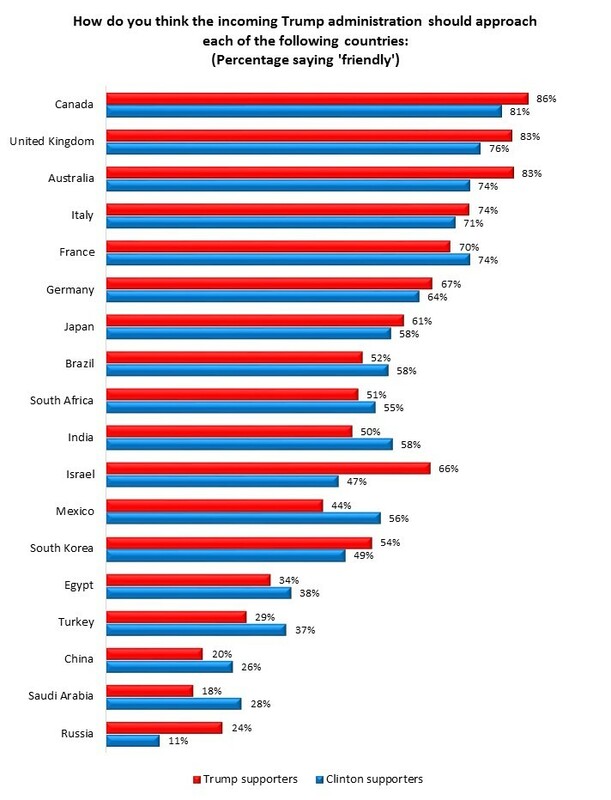 Click for full-size imagePerhaps it comes as no surprise – but some will find it reassuring nevertheless – that 80 per cent of Americans rate their Northern neighbour in the top two of these categories (only 3% harbour negative feelings about Canada). This places Canada at the top of the list of Americans’ friends and allies – marginally ahead of the UK and Australia. At the bottom of the list – with more detractors than supporters – are China, Saudi Arabia, and Russia. For each of these nations there are more Americans who say that the Trump administration should approach them warily, as threats, or as outright enemies, than those who feel that friendship status should be assumed. The very positive views of Canada are evident among both those who supported Trump and those who preferred Hillary Clinton in the recent U.S. election. If anything, Trump’s supporters are slightly more likely to display positive views of Canada. When it comes to the three countries at the bottom of the list, however, important partisan differences emerge. Trumpists are more likely to see China and Saudi Arabia in a negative light compared to Clintonites, but in the case of Russia the pattern reverses itself: Trump supporters are more than twice as likely to feel that Russia should be considered a friend. Who benefits from the trade relationship? – When asked who benefits the most from existing trade relationships, American views of Canada and Mexico are very different. Slightly more than three-quarters of voting-age Americans see the Canada-U.S. trade relationship as benefiting both countries equally. Among the remaining quarter, a slim majority actually see the U.S. benefiting more than Canada. In the case of Mexico, only one-third see balanced benefits for each nation, while about half feel that Mexico garners more benefit from trade than the U.S. Overall, these results underscore the need to avoid the ‘NAFTA umbrella’ when examining trade and security relationships across North America. Canada enjoys a far more favourable perception among US voters across the political spectrum. Mexico must, sadly, deal with far more hostile public opinion, which will create a different dynamic as it approaches the Trump government. Whether this reputation is deserved or simply an artifact of Trump hyperbole, it presents the Mexican government with an uphill battle to win American hearts and minds. Canada enters the Trump era with huge reserves of goodwill among a clear majority of Americans. Its challenge is how to successfully navigate the bitterly divided American public, while remaining a friend and trusted ally to all. For more US polling, visit our recently launched America Project.